Austin Asche and Nancy Giese were conferred their Emeritus Chancellorships by Vice-Chancellor, Professor Barney Glover (middle). 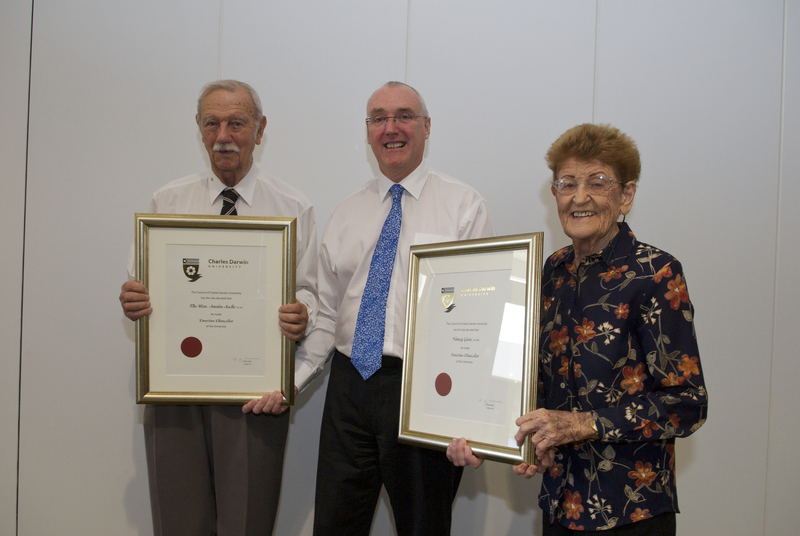 Two Chancellors of the former Northern Territory University (NTU) have been awarded Emeritus Chancellorships at a recent ceremony at Charles Darwin University. Austin Asche QC and Nancy Giese were conferred the Emeritus Chancellorships in recognition of their long-serving commitment and contribution to the university and to higher education in the NT. A former Judge and Chief Justice of the Supreme Court of the Northern Territory and Northern Territory Administrator, Mr Asche was Chancellor of NTU from 1989 until 1993 when Mrs Giese replaced him in the top governance post. Mrs Giese was appointed to the Interim Planning Committee of the Darwin Community College in 1972 and played a prominent role in getting the College back on its feet after it was damaged by Cyclone Tracy in 1974. Mrs Giese retired as Chancellor in 2003 when NTU became Charles Darwin University. The ceremony also saw the unveiling of portraits of former CDU Chancellor, Richard Ryan AO and former Vice-Chancellor, Professor Helen Garnett by prominent Sydney artist, Danelle Bergstrom. Mr Ryan has been an integral part of the tertiary education landscape in the Northern Territory since the days of the Darwin Community College in 1985, and then with the Darwin Institute of Technology, Northern Territory University and CDU. Mr Ryan retired as Chancellor in December 2009 after six years in the position. Professor Garnett became the first Vice-Chancellor of CDU in October 2003. She has a national and international reputation for her contributions to the life sciences, and the peaceful development and application of nuclear technologies. Professor Garnett retired as Vice-Chancellor in December 2008.